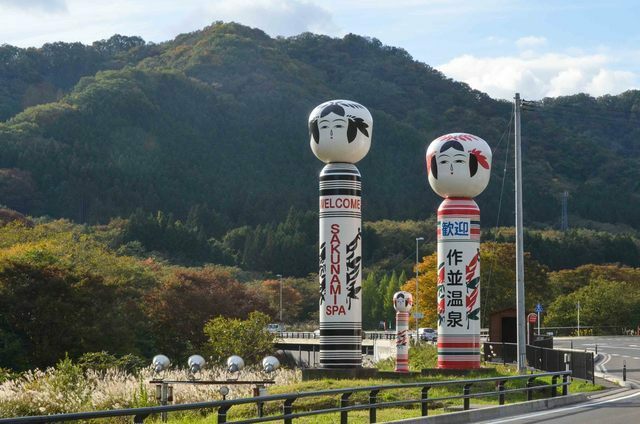 Iwatsuki, a ward in Saitama City, Saitama Prefecture, grew famous in the 17th century as a major producer of hand crafted dolls because of the large amounts and high quality of the kiri (paulonia) trees that grow in the area. They became most famous for producing the special dolls displayed during Hina Matsuri, or the girl’s festival held every March 3rd. 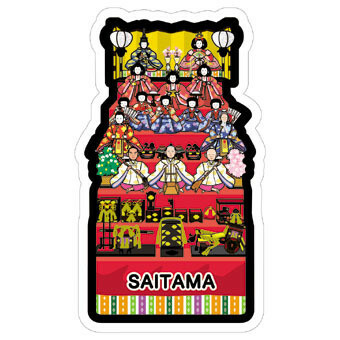 Saitama’s 6th postcard celebrates this long tradition in the “doll town” of Iwatsuki. You can read more about the origins and traditions of Hina Matsuri here, and all about the dolls and what they stand for. There are up to 7 levels of dolls, and it is common in Japan for grandparents to buy their granddaughters a set (or at least the top two main dolls) to display at this time. I have seen many of these dolls, though I don’t have a set myself, and each one is beautiful and unique! 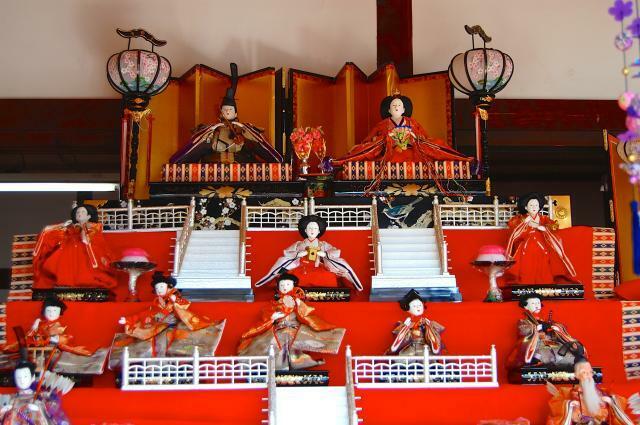 A town I lived in until recently has an annual display of Hina Matsuri dolls, with local collectors and owners lending the dolls to be displayed in town. A close up of the upper levels. Most girls have at least the top two dolls, representing the emperor and empress. Iwatsuki is the main producer of Hina dolls in Japan, so any retailer selling around the country is probably selling dolls from Iwatsuki! But if you’d like to get up close and personal to the dolls and makers themselves, Iwatsuki is an easy trip from Tokyo, and there is a lot to do in the town. Of course, if you can visit on March 3rd, that is the best time to see not only the dolls, but a real life procession, and other fun events. However the two museums, Tougyoku Dolls Hall and the Tokyu Doll Museum are open to visitors year-round. Moreover, with a walk around the area it is easy to spot workshops and stores around the area. Enjoy girl’s day and these beautiful dolls! 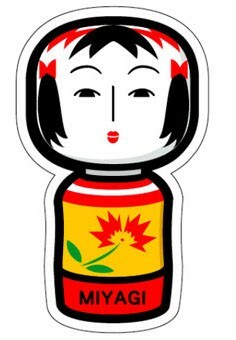 Kokeshi are wooden, painted dolls originally from the Zao onsen area of Miyagi Prefecture, but spread to several other onsen towns in the area, and on to the rest of Japan around the Edo Period. Their faces have changed and modernized through time, and now you can find many forms and styles of these dolls sold all over the country. However the original style of head and body is still produced in Miyagi today. There are 5 onsen towns in Miyagi generally considered as the main producers, each with a slightly different shape and style: Togatta (probably the original), Naruko, Yajiro, Sakunami, and Hijori. This postcard appears most like the Naruko style, which most commonly features bangs and 2 pigtails of hair on the head, as well as reds and yellows on the body. The yellow became popular from around the middle of the Taisho period. 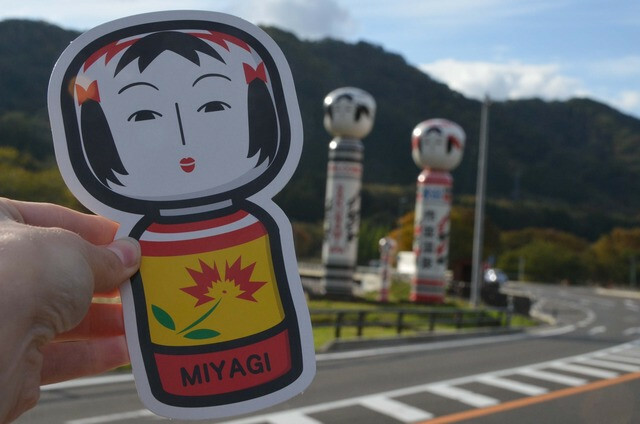 You can visit the Japan Kokeshi Museum in Naruko Onsen, Miyagi Prefecture, to see craftsman making the dolls, try painting your own, and of course, buy the dolls themselves. There’s also an All-Japan Kokeshi contest, a Kokeshi Shrine, and a Kokeshi Festival as well. This year marks the 57th Contest, held in Shiroishi, Miyagi on May 3~5. 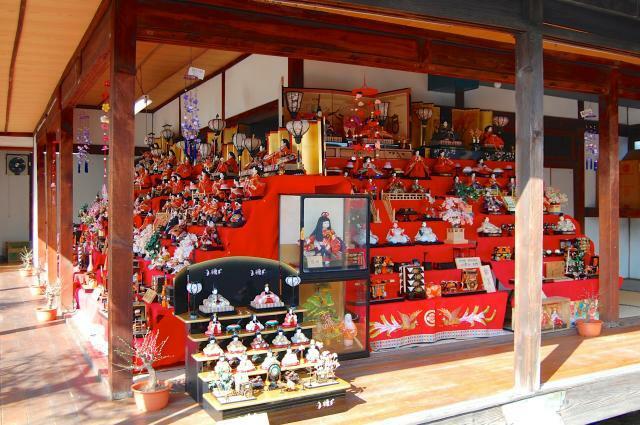 The festival is February through mid-March at the aforementioned Kokeshi Museum. And of course, these dolls in different styles can be bought all over Japan. When I was a child, I had a Naruko Kokeshi, and the head does indeed squeak! Edit 2015.11.13: I drove by these giant kokeshi dolls in Sakunami Onsen and took some quick pictures even though I didn’t have time to stop at the actual onsen. What a nice welcome!